In my first box is Roman Reigns. 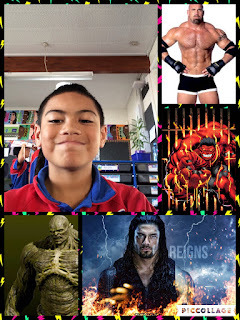 The reason why I picked Roman Reigns is because he is my favourite wrestler. Next, in my 2nd box, is the Abomination. The reason why I picked the Abomnation is because he's strong and powerful and he has muscles. Next, in my 3rd box is Red Hulk because he's cool and he's on fire. Next in my 4th box it is Goldberg. Now Goldberg is a man that wrestles.